History - Savannahs are a cross between a Domestic cat and the African Serval Wild cat. One of the smaller Wild cats, reaching 50lbs at maturity. Named from the habitat of the African Serval. It was created in the 1980's and became recognized by T.I.C.A. in the 1990's. Allowing third generation Savannah cats into cat shows for evaluation by judges. F1 through F4 Males are known to be sterile. Making this a difficult breed to reproduce. Colors and Coats Types Available - Savannah colors include, Solid Black, Black Smoke, and Spotted Tabby. 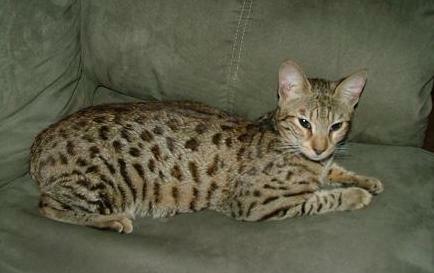 The Spotted Tabby should have bold, Black or Brown markings against a background of Gold, Orange, or Silver. Some may have thick bands of Black on their ears like the Serval. depending on their generation. Grooming and Care - No grooming is required for Savannahs. Although they may help themselves to a bath if given the chance. You will want to keep their nails trimmed, they are definitely climbers. They also enjoy raw meat as part of their diet. Because of their growth, they should be supplemented with vitamins. Due to the fact they are part Serval, they are illegal in many states. You should check your state laws and requirements before considering owning a Savannah. Best Suitable Environment - Savannahs are extremely social! They want to be a part of everything you are doing. they need an active household with lots of attention. They demand attention. Extremely social with all family members. They need to be with other pets. Extremely social to dogs & other breeds. They can be very large in size. Males reaching about 30lbs. Put your breakables away! They are not graceful before reaching maturity. Please check your state laws and requirements before considering owning a Savannah. Personality Traits - Highly intelligent. Can be taught to fetch, sit, stay, and some. High energy. Can jump up to ten feet. Extremely social, loyal and loving. Very mischievous! Easily trained. Our Savannahs have welcomed all our pets into their warm cuddles & hearts. From our Pom to our rescue kittens, no matter how big or how small. That is until they hear a bag of potato chips being opened! Savannah Breeders: When choosing a breeder please use your better judgment and please read our valuable reputable breeder tips to guide you in finding your best friend. Please keep in mind that Kitty Cat Breeders does its best to maintain a reputable list of breeders; however we will not be responsible for any of their obligations or duties; buy responsibly. At FusionKatz our kittens are raised in-home, around children. We specialize in wild looking kittens with golden or silver coats. 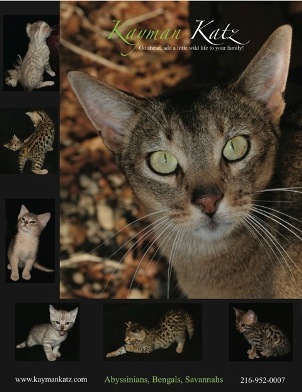 We are breeders of Bengal and Savannah kittens. All kittens are of top quality bloodlines and raised in our home. Our kittens make purr-fect companions. F3 and F6 savannah kittens, hope to have F1's soon. Come with a health guarantee. When choosing a breeder please use your better judgment and please read our valuable reputable breeder tips to guide you in finding your best friend. Please keep in mind that Kitty Cat Breeders does its best to maintain a reputable list of breeders; however we will not be responsible for any of their obligations or duties; buy responsibly. Savannah Classifieds: Kittens for Sale - When choosing a kitten please use your better judgment and please read our valuable reputable breeder tips to guide you in finding your best friend. Please keep in mind that Kitty Cat Breeders does its best to maintain a reputable list of breeders; however we will not be responsible for any of their obligations or duties; buy responsibly. 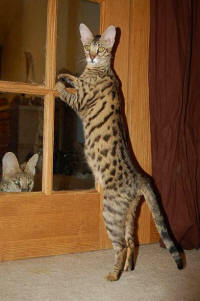 One large male and one exotic female savannah kitten ready for new home now. Both golden toned with black spots. Savannah Classifieds: Retired Breeders/Cats for Sale - When choosing a retired cat/cat please use your better judgment and please read our valuable reputable breeder tips to guide you in finding your best friend. Please keep in mind that Kitty Cat Breeders does its best to maintain a reputable list of breeders; however we will not be responsible for any of their obligations or duties; buy responsibly. Savannah Classifieds: Stud Services - When choosing a breeder for your stud services please use your better judgment and please read our valuable reputable breeder tips to guide you in finding your best friend. Please keep in mind that Kitty Cat Breeders does its best to maintain a reputable list of breeders; however we will not be responsible for any of their obligations or duties; buy responsibly. Currently No Listings - Please check back soon!